Asia is expected to lead the global refining industry, both in terms of capacity as well as capital expenditure (capex), between 2019 and 2023, according to GlobalData, a leading data and analytics company. The company’s report: ‘Global Refining Industry Outlook to 2023 – Capacity and Capital Expenditure Forecasts with Details of All Operating and Planned Refineries‘ reveals that the global crude oil refining capacity is expected to increase at an average annual growth rate (AAGR) of 4% from 102,603 thousand barrels of oil per day (mbd) in 2018 to 125,163 mbd in 2023. A total capex of around US$648bn is expected to be spent globally to construct new-build refineries and for expansion of the existing refineries during the forecast period. Refining capacity in Asia is expected to increase from 34,050 mbd in 2018 to 43,365 mbd in 2023 at an AAGR of 4.8%. Between 2019 and 2023, 45 new refineries are expected to become operational in Asia. The region has a capex of around US$267bn for construction of new-build refineries and for expansion of existing refineries during the period. Within the region, China will have the highest refining capacity of around 19,354 mbd by 2023. GlobalData identifies North America as the second largest region in terms of refining capacity. The region is expected to have 25,114 mbd of refining capacity by 2023. 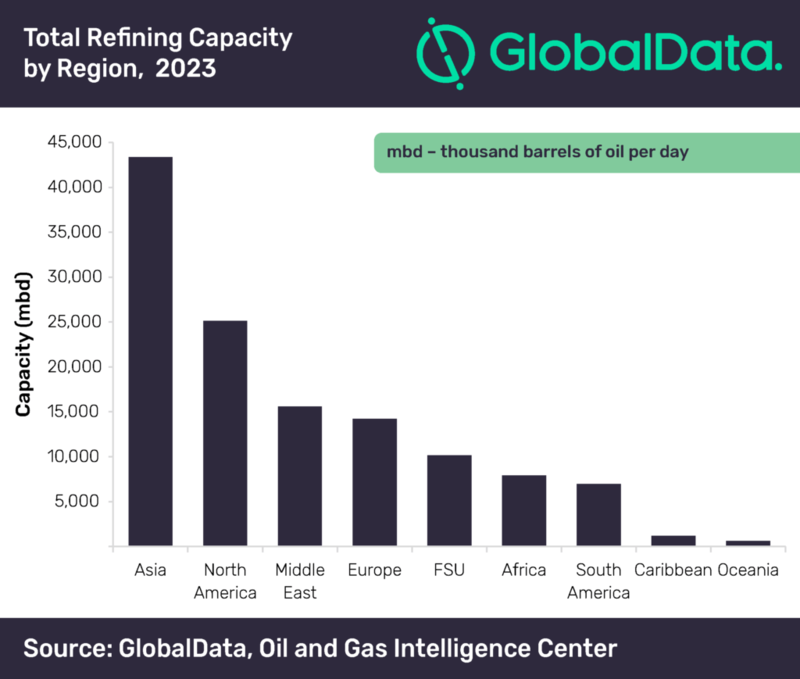 Within the region, the US will have the highest refining capacity of roughly 19,624 mbd. The region has new-build and expansion capex of around US$62.9bn to be spent on active and upcoming planned refineries during the forecast period. The Middle East is the third largest among the regions in terms of refining capacity as well as new-build and expansion capex spending on active, planned and announced refineries over the four-year period. Within the region, Iran and Saudi Arabia are expected to be the major contributors with refining capacity of 3,660 mbd and 3,266 mbd, respectively. The region plans to spend around US$98bn on the active and upcoming refineries between 2019 and 2023. In terms of refining capacity, among upcoming refineries globally, Dayushan Island refinery in China, Lagos I refinery in Nigeria and Al-Zour refinery in Kuwait lead with 800 mbd, 650 mbd and 615 mbd, respectively. In terms of new-build capex on upcoming refineries globally, Dubose Flats refinery in Canada and Tabi refinery in Angola will lead with US$14bn each. The Vadinar refinery in India will lead in terms of expansion capex spending with US$12bn during the outlook period.